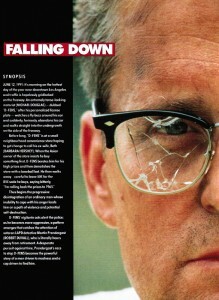 Moreso than anything else in the film, D-Fens’s glasses have become Falling Down’s iconic image. 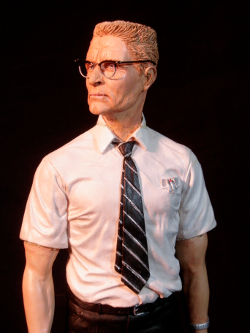 Parodies are instantly recognizable from the combination of the frames with a short sleeve shirt and tie, and even the recent DVD release emphasizes their appearance with a loving closeup of Foster’s grimacing face framed by the battle-damaged frames. In a story that is largely about broken ideals and the loss of an idea of America, the choice of glasses couldn’t have been more appropriate. 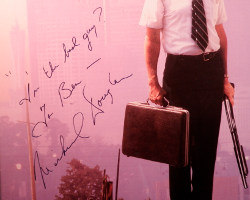 Though the imagery may be lost on many younger viewers just coming to enjoy the film twenty years after its release, when Falling Down hit theaters in 1993, the frames were probably recognizable to a majority of middle-aged viewers. The style referred to as “browline glasses,” also known as “combination frames.” The Shuron Optica company began manufacturing them in 1947, and quickly started something of a craze. Though it’s a strange thought now, plastics being used in everyday life was something relatively new to Americans in the 1950s. Appliances and other household wares had traditionally been completely metal; the introduction of plastic casings cut down on costs and allowed the emerging post-war generation to set themselves up comfortably for a minimal investment. The idea that this fusion of plastic and metal could carry over to eyeglasses as well struck a chord with Americans, and pretty soon half a dozen other eyeglass companies were producing their own browline frames to get in on the action. By 1960, half of all Americans wearing glasses were wearing browlines. For Americans with vision problems, browline glasses were tough, confident, and rugged; rather than suffer with poor vision, they could turn their handicap into a symbol of American ingenuity and perseverence. From a fashion standpoint, browline glasses helped to define the 1950s, right along with flattop haircuts and poodle skirts. It was for this reason, then, that a backlash grew against browlines as the children of the 1950s grew up to become the counter-culturalists of the 1960s. Rebelling against the class-conscious, status-quo driven conformity of 1950s consumer culture, the young people of the late 1960s and early 1970s distanced themselves from anything even remotely resembling something their parents might have owned or worn. This meant that browlines had to go. The glasses had already begun to suffer a backlash in the early/mid 1960s, as literally everyone and their dad was wearing them; anytime something becomes too popular, something new and unique has to come and take its place. Rather than just slip out of fashion, though, browline glasses ended up on the receiving end of serious hate. People still wearing browlines in the 1970s weren’t just considered unfashionable: Regardless of the individual’s actual beliefs, wearing browlines post-Vietnam came to identify someone as a racist, sexist, conformist, stubbornly trying to uphold the ideals of an aging generation even as a younger, more enlightened, more savvy one was taking over the country. Sound familiar? In many ways, Falling Down is about the last gasp of the 1950s in the face of the savagery borne of the early 1990s recession, set at that culture’s ground zero: the gang-ravaged, at-one-another’s-throat “melting pot” of Los Angeles. While proponents of 1950s social values had been given a “second chance” in the form of the Reagan 1980s, the economic collapse that came to define the early 1990s, and the resultant societal backlash, proved to be the final nails in the coffin of mid-century Americanism as an acceptable, mainstream ideal. In another era, D-Fens would have been the ideal American: A hard-working husband and father with unwavering loyalty to his job, country, and beliefs. (Amidst the climate of anti-government sentiment that defines conservative politics in 2013, it may be hard for younger readers to believe that in post-war America, loyalty to the government was synonymous with patriotism). The “lies” told to D-Fens were the standard line given to an entire generation of American men, all led to believe that getting up in the morning and going to work were all that was necessary for a lieftime of financial security and prosperity. It’s appropriate, then, that the glasses that came to symbolize the outdatedness of the 1950s generation were chosen by Falling Down Costume Designer Marlene Stewart as Foster’s glasses. Not only do they put his character into context as a “leftover” from another era, but they are literally how he sees the world: A portal which warps his environment and leaves him perceiving of life as still existing as it did during another time. And, of course, the crack that appears in his glasses partway through the film symbolizes his own fragmented and fractured vision not only of America but indeed of his own life. An interesting side note is that, despite browlines being a widely available style of eyeglasses, the particular brand that Foster wears remain a mystery. During the original heydey of browline glasses, the majority of frames were produced by a small number of successful manufacturers: Shuron Optical, Art-Craft Optical, Bausch and Lomb, American Optical, and Victory Optical. Many webpages claim that Foster is wearing Shuron frames; this is understandable, as Shuron optical has produced more browlines than any other company, and in fact continues to manufacture them to this day. However, this is incorrect. Though, to casual observers, most brands probably look alike, there were subtle differences between every manufacturer’s frames, from the shape of the lens to the placement of the bridge. The easiest way to tell different brands apart, though, are the little pieces of metal in the upper corners—called “rivet covers.” In the early days of frame manufacturing, the arms of the glasses were actually riveted on; the rivet covers were a way to make the frames more decorative while also securing the rivets. Manufacturers all had their own different types of rivet covers, so to the trained eye, different brands were distinguishable with a quick glance—not much different from determining the make of a car by looking for the logo. Over time, several manufacturers started putting arms on the glasses in ways that didn’t require rivets, but they still put the metal—known instead as a “plaque” –on for decoration/identification. Shuron Optical’s rivet cover design was the staff, a thin rectangle ending in a small bulb; Art-Craft’s were similar, but instead of the bulb, the river cover sort of slanted up, creating a kind of ramp shape; and Victory Optical had little V’s. American Optical had different types of plaques. The first, and more well known, was the stylized “wing,” as seen on Malcolm X’s American Optical Sirmonts (itself a very popular model). They also had plaques which were little “AO”s. Bausch and Lomb was unique in that they used multiple types of rivet covers. They had chunky “+” signs. They also had chunky, slanted “-“ signs that look similar to Art Craft’s river covers, except B&L’s had a much softer taper. They had shapes that looked like diamonds with one edge thicker and one edge thinner. Of course, D-Fens has diamond shaped rivet covers. This has traditionally been the rivet cover design for Ray-Ban’s browline frame, the Clubmaster; however, because it is so basic a shape, it is also the one most found on generic, knock-off browline frames. It is easy to tell that D-Fens is not wearing Ray-Bans by looking at the bridge, which is the most unique feature of his glasses. The bridges on virtually every manufacturer’s browlines are thick, rectangular slips of metal. D-Fens’s glasses, though, have what is called a “rolled bridge”—a thin, cylindrical piece of metal that is meant to simulate the kind of bridges found on much older styles of glasses. Having this type of bridge on a pair of browlines is almost unheard of, making D-Fens’s glasses very unique. 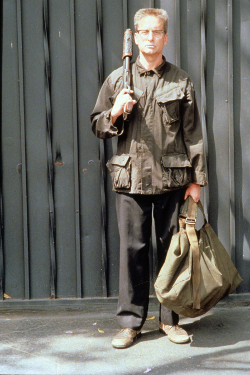 (Though some Internet sites claim they are a “first generation” Clubmaster from the 1980s, contemporary photos show that virtually nothing has changed in the construction of the Clubmaster from the 1980s to the present). 1) Knock-off goods are, by definition, trying to mimic something more popular. A generic brand would most likely have had the same type of bridge in order to more look like a branded frame. 2) D-Fens goes through a fair amount of physical abuse through the movie; the production team would have needed multiple pairs of glasses in order to serve as backups in the event that a pair broke or were severely damaged. Buying the glasses as cheap knock-offs could have meant not being able to get their hands on any more in the event that all of the glasses were damaged/broken. (This also raises the possibility that the frames were made by a company that was still manufacturing them in the 1990s). 3) Most tellingly: Recently, a character on the CBS show Vegas has shown up wearing identical frames, down to the diamond rivet covers and rolled bridge. It is unlikely that a line of cheaply produced, knockoff frames with such a unique identifying feature would still be in production over twenty-years later, and that those frames would also be chosen by another large-budget production. The mystery remains, then: who manufactured these iconic glasses? If you know, contact us through this web site! Preston Fassel is an optician in Houston. The July 1993 issue of the British magazine Empire had several in-depth articles on Falling Down, including one piece that commented on why the film was “geographically unsound,” and a second offering an analysis of how the film came to be. “Surely D-Fens doesn’t expect to walk from Lincoln Heights in downtown L.A. to Venice Beach in one day?… Indeed, ‘D’ could have made it easier for himself if he hadn’t rather bizarrely insisted on machine-gunning a phone booth on the corner of Sunset Boulevard and Laurel Avenue—miles out of his way—and if he hadn’t decided to take a detour through snootsome Beverly Hills just to have a go at the richies. As the crow flies, it’s a 15-mile trip to Venice from Lincoln Heights, which is quite enough for one day’s walk—as D-Fens rampages, you’re looking at at least 25 miles. Hollywood is filled with stories of important (and not-so-important) films that almost never got made. 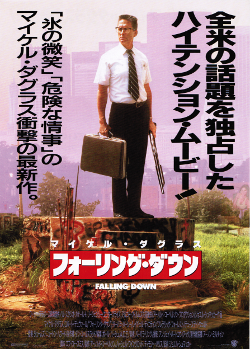 Falling Down is one of them. Ebbe Roe Smith’s script had been rejected by every major studio in Hollywood, and it looked destined for cable television when Michael Douglas, fresh from his star-affirming role in Basic Instinct, looked at it. He proclaimed it one of the best scripts he’d ever read and in short order contacted producer Arnold Kopelson and longtime friend director Joel Schumacher. “I remember thinking, ‘Thank God no one’s made this movie, because I get to make it,’” said Schumacher. Like Douglas, Schumacher is no stranger to controversy. When he made Flatliners he was criticized as irresponsible because certain factions in the U.S. felt that the nation’s teenagers would try to imitate the film’s heart-stopping experiments. With Falling Down it was the Korean community and, weirdly, the defense workers whose wrath he evoked. And it wasn’t just minorities that had a beef with the film. Even the defense worker’s union defensively protested that Foster was not representative of their workers. “Defense workers picketed the film,” Schumacher says, “because they were all unemployed and they feared that people would see the film and think that all defense workers were crazy, and so no one would hire them. But people with abhorrent behaviour appear in films from all walks of life. People did not stop committing adultery after Fatal Attraction. People did not stop taking cabs after Taxi Driver. I felt [the protests were] a very good way for them to get publicity, because these are the people who were working to defend the country and were then just thrown out on the street…. I empathize with them. I’ve been unemployed many times in my life, and in Hollywood you never know. People often erroneously think that a film has a single script or screenplay. In theory every film has a script, but in practice almost every film has many versions of the script. Films are often re-written and revised during shooting, and so there may be a dozen or more slightly different versions of the script (though there should only be one at any given time). 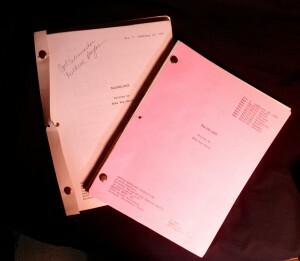 To help keep the actors and crew on the same page (literally), directors often use different colored pages for different versions of the script; a version dated April 4 may be light green, for example, and a version dated April 12 might be yellow or blue. I own two scripts of Falling Down, representing at least seven drafts between February 18, and May 11, 1992. Reading the different drafts gives insight into how the screenwriter originally envisioned the film, subplots that were added or dropped, etc. I present here some notes about scenes and dialogue that differs from the final film version. The scene numbers are taken from the early scripts and may not reflect the final filmed scene sequence. Scene 15/16: The Coke that D-FENS buys in the Korean grocery store was originally a quarter, not eighty-five cents. The early drafts had much more dialogue between Prendergast and his wife, making her a more nagging, superstitious character (for example she warns him about having an unlucky day because of his horoscope). 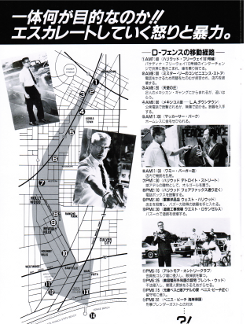 Scene 21: The dialogue between Brian (the Japanese police officer) and Mr. Lee about not smoking in the police station isn’t in the early drafts. The exchange was probably included to add some humor: Brian makes a point to Prendergast that he’s Japanese not Korean (“in case you never bothered to notice”), yet he tells Mr. Lee not to smoke—in Korean. Scene 50: In the early scripts there’s no Spanish spoken during the police interrogation of Angie; in the film at least three characters speak Spanish at some point: Angie, Det. Torrez, and Angie’s mother. 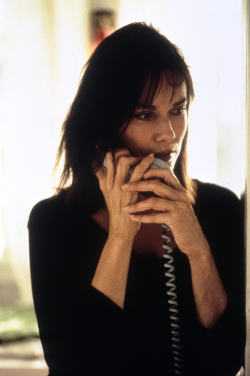 Scene 54: Prendergast’s wife calls him at work about their missing cat. In the film “Mr. Peepers” scratched her, but in the script she tells him she’s planning to get the cat’s “balls fixed” (presumably this is also symbolic of Prendergast’s own emasculation by his wife). Scene 67: In the early script we learn that Prendergast’s deceased daughter was named Annabel. Scene 70: In the early script when Nick has D-FENS pinned against a table in the back of the Army surplus store and asks why D-FENS can’t give him his hand, the line is not “I’ll fall down” but instead “I’ll fall over.” Since the title had already been chosen for the film, the word was probably changed as an easy reference back to the title. Scene 76: In the early script that audience sees Nick’s body, while in the film it’s only referred to in the dialogue: “Between the Vietnam jungle boots we see that the dead body of the Owner has been stuffed into the display case. He leaves money for his boots and leaves.” This scene, which is structured to echo back to D-FENS’s original encounter with Korean shopkeeper Mr. Lee, was probably written out in later drafts because it was too violent and would alienate audiences. Scene 90: On the golf course when golfer Frank is having a heart attack, he tells D-FENS “Don’t let me die,” to which he responds, “You’ve lived too long.” As with the previous scene, the line was probably cut for being too harsh or cruel. Scenes 107-108: In the early script the scene with Susi the Stripper has much more dialogue; it was probably cut for time, and because it didn’t really advance the plot. Scene 123: In the early script when D-FENS is running onto the Venice Pier after Adele and Beth, he encounters a TV company shooting a car commercial at the pier. Scene 126: In the early script during his encounter with D-FENS on the pier, Prendergast picks up D-FENS’s daughter Adele, almost using her as a shield in case D-FENS shoots at him. This was probably left out of the final film because it made him look cowardly. Also the early script featured a fist fight between D-FENS and Prendergast (“D-FENS beats Prendergast down to his knees”), while in the film the two never touch each other at any point in the film. On a business trip to Los Angeles in 2005, I decided to take a side trip to try and find an empty field somewhere near downtown L.A. Well, not just any empty space but a scene location for Falling Down. Where in Los Angeles was this scene shot? 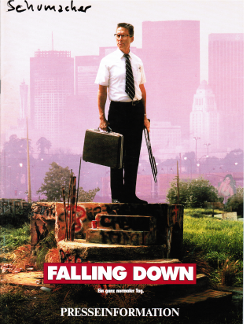 Falling Down follows a day in the life of Bill Foster (Michael Douglas) a Los Angeles worker drone whose life is falling apart around him. The first scene (reminiscent of Fellini’s 8-1/2) has Foster stuck in that quintessentially Los Angeles annoyance, the traffic jam. A series of irritants annoy him, and finally out of exasperation he bursts out of his car and walks away. “I’m going home,” he says to the irate driver behind him (played by the film’s screenwriter Ebbe Roe Smith). For as easy and simple as “going home” for his daughter’s birthday should be, the comforts of home are elusive. His wife has left him, and we finally learn that he lost his job. 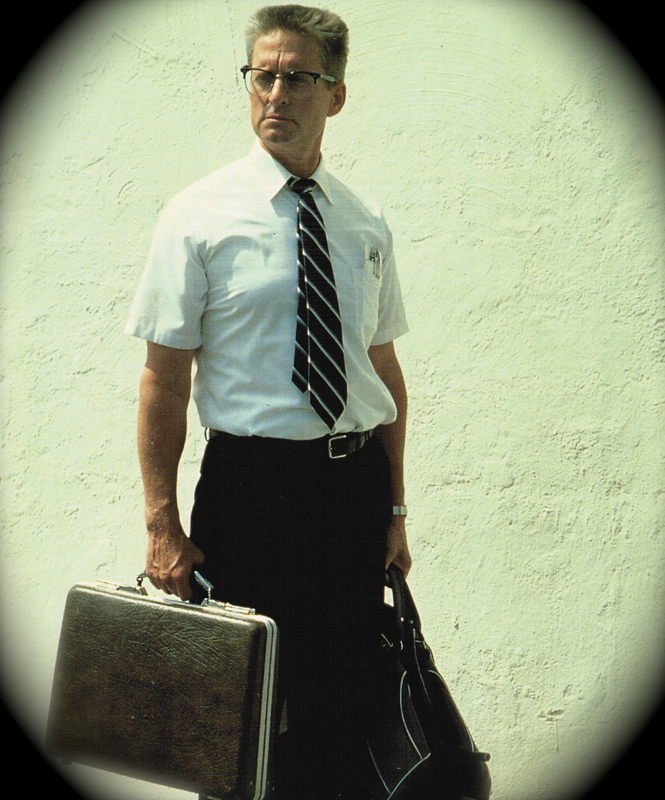 Falling Down is a terrific glimpse of (and commentary on) the early 1990s, and 1990s Los Angeles in particular. 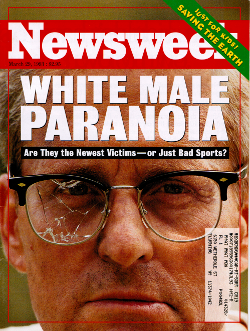 The film captured the zeitgeist so well, in fact, that a frame from the film made the March 29, 1994, cover of Newsweek. The film’s poster depicts the bespectacled quasi-nerd standing defiantly atop a graffiti-scrawled concrete slab. He has his briefcase in one hand and a gun in the other. Behind him, hazy through the smog, looms the Los Angeles skyline. I have always wondered where exactly that scene was shot. (The poster art, by the way, is technically inaccurate; in the plot’s sequence, he doesn’t pick up the gun until he leaves that location.) As far as I knew the film was shot entirely in Los Angeles, including on the freeways and at the Venice Pier (which was closed at the time of filming and had to be reopened for the shoot). A few weeks before I left, I bought a map of L.A. and tried to figure out where the scene might have been filmed. From a close examination of the poster, I was able to faintly make out the name ARCO at the top of one of the buildings. I searched online and scoured the city map, finding an ARCO plaza in the downtown area. I tried to get a rough idea of where the scene would have to be shot judging from which buildings were in the background. My best guess was within a half-mile west of the 100 Freeway between Wilshire Boulevard and 3rd Street. A friend and I circled downtown L.A. for about half an hour, trying to match up the buildings in the background to the movie poster art. Nothing seemed to quite work; we could recognize a few of the buildings, but the actors were all too far away for the scale to be right. So we then re-examined not the poster itself but a still frame from the film I had brought. I suspected that the poster was in fact a graphic composite, not really of any technically accurate place but an overall scene. The still frame photograph, however, was almost certainly an actual location in the area. In that, Michael Douglas, sitting on the concrete steps, is fairly near a tall building with black and white vertical lines. Aha! That helped narrow it down, but still we weren’t quite there. After another half an hour in the warm California sun, I eventually asked people who would know the city far better than I: the police. I asked two cops in different parts of the city, one to get to the general area and another once I got there. Both peered at the 4 by 6 photo and pretty quickly told me it was near the Rampart area, not far from Cesar Chavez Avenue. You’d think that finding a sizeable vacant lot near downtown L.A. might be easy, but in fact it turned into quite a chore. After a bit more walking and driving, we drove up a small hill and found it. The area where the scene was filmed is near where the 110 Freeway meets W. 1st Street, near Boylston. The exact address is 100 N. Boylston Ave. at 168 Edgeware N. The skyline had changed slightly since the film was shot in 1991, but the landforms are more or less the same and a pile of concrete rubble sits at or near the site. (Once I returned home and watched the DVD carefully, I noticed that I could have saved myself quite a bit of trouble had I simply paused and zoomed in on a scene where Foster is walking up a hill, followed by gangsters. The sign in the background is fuzzy but decipherable: Edgeware Rd.). Off to the right, up the hill a few hundred yards, sits a white house on a cliff overlooking the area. I spoke with the owner. He said that he didn’t live there when the film was shot, but that his property (and the surrounding area) had been used for film locations several times before. He pointed to what looked like ragged brick stonework at the entrance to his driveway. At first glance it seemed unremarkable, but upon closer inspection he showed that it was leftover set dressing from a film. The brick is fake. His house was used for several films including Like Mike and the disaster film The Day After Tomorrow. As of 2009 a school was being built on the site, and it was officially a not-terribly-active construction site. A slightly-built Asian guard allowed my friend and I to walk a short distance onto the site, but beyond that, as Foster was told as he entered the area, “No trespassing.” So we got some photos and wrapped up a successful search. At the time of my search there were no other references available to me for deciphering the exact locations used. Since then, however, the Internet Movie Database has listed about a dozen filming locations, including Nick’s surplus store (Surplus Value Store at 3828 W Sunset Blvd at Hyperion, Los Angeles); the plastic surgeon’s house (1000 N. Crescent Drive, Hollywood); Whammyburger (Angelo’s Burgers at 10990 Atlantic Avenue, Lynwood); Beth’s house (18 Ozone Avenue, Venice Beach); and Mr. Lee’s market (458 N. Madison Avenue, Los Angeles).